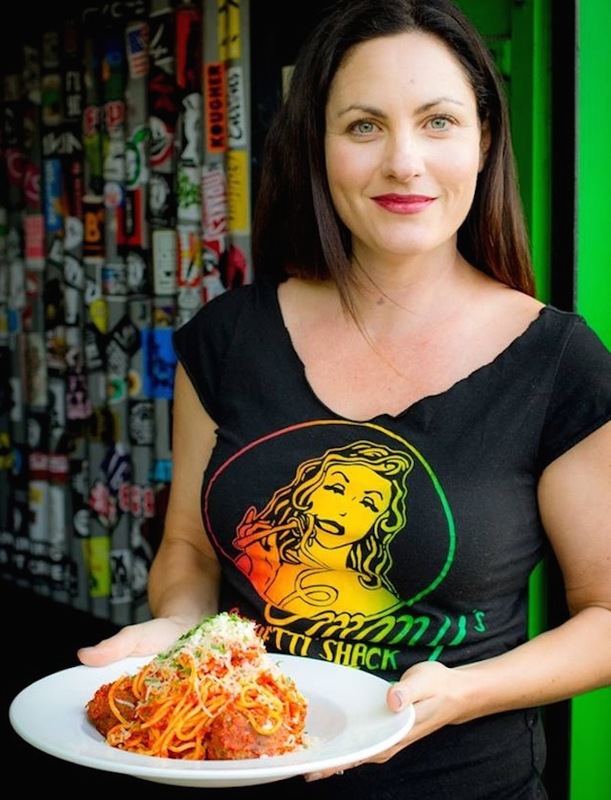 As you know, Miss Emmy Kaplan from the eponymous Spaghetti Shack recently announced plans to relocate her restaurant to a new location a few blocks north. Want to let our Bernal neighbors know that Tuesday night will be our last at 18 Virginia St.
We are hoping to open to the public either Friday or Saturday night at our new location, 3230 Mission Street. We hope to be accepting reservations through our Facebook page as soon as Friday morning and presenting a happy hour and late night menu in a week or two. Hope to see some regulars and neighbors over there soon! I’m sorry, but that place is an Urban Uglification Project. When they had the chance to create a new image, they blew it, and the new place has the same downscale, ridiculously ugly theme as the old one. Exterior appearance makes a huge difference to any neighborhood, and this is not a plus factor for Bernal. Many of us here like Emmy’s for what it is. I look forward to enjoying the new digs. Many of us have no choice but to accept reality like it is, and the reality is that the exterior of the old Emmy’s was schlocky and detractive. I couldn’t disagree more Tom. I was worried the new location wouldn’t have the same theme, charm, and appeal but it appears that it will. And I always had a hunch that the fun and lively exterior was keeping away the duds, keep up the great work Emmy and team!! Excited for Miss Emmy! Congrats on the growth and new location! Congratulations to local girl Emmy! Personally, I always felt it was too expensive for what you got. With the move I assume that the prices will go up. Oh well. I’ll definitely try it. I love Italian! Congrats Emmy on the move up! My kids and I love Emmy’s and hope the new place has the same great atmosphere (inside and out), food, and grown-up drinks. I wish we would have been able to enjoy one last meal at the old location – I am feeling a little nostalgic about our favorite leopard-print booth. The exterior of the old location was run down and the booth seats were like lumpy oatmeal…but I never cared much about that stuff. My wife and I enjoyed walking over to be among the first customers at opening so we could dine at the bar. The mix of adults and families with children added to the fun atmosphere. I know they were not the most economical option, but I always felt the team at Emmy’s was genuine, the food was solid and the drinks tasty. I dunno – I’m feeling lukewarm about the new Emmy’s. The space is a bit cavernous and lacks the coziness of the old space. They had been in operation for only three nights when we went on Sunday so I’ll give them the benefit of the doubt but we had terrible, terrible service. We came in right at opening at 5:30 and it took almost 2 hours to get our meatballs after we were seated. They say hunger is the best ingredient, but that’s ridiculous. Our particular server was super surly and the dishes we had (aside from the meatballs, which I do enjoy still) were mediocre at best.